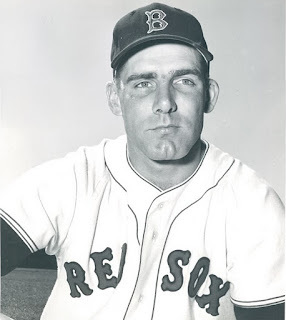 Al Van Alstyne found himself in spring training with the Red Sox in 1952 surrounded by their 15 best prospects, all trying to fill the void of Ted Williams pending leave for active duty in the Korean War. The Red Sox paraded 14 different players to the outfield after Williams departed for service at the end of April; unfortunately, Van Alstyne wasn’t one of them. His father's baseball connections opened the door for his signing with the Boston Red Sox in 1950 from St. Lawrence University. “My dad played in Washington with Joe Cronin, and he was with me the day I signed in Boston, as Joe was the general manager there,” said Van Alstyne in a 2009 phone interview I conducted with him. He reported to Scranton of the Eastern League a month late after breaking his thumb playing ball right after he signed with Boston. His brother Clayton was playing for the Albany Senators which gave him the opportunity to fulfill a childhood dream, to face his sibling in pro ball. “I played against him my first year in Scranton, that was his last year. It was very enjoyable,” he said. Van Alstyne earned his first of three invites to spring training in 1952 after having an All-Star season with Class C San Jose in 1951. Surrounded by a combination of established veterans and a volume of upstarts such as Jimmy Piersall, Gene Stephens, Tom Umphlett, and Bob DiPietro, there just wasn’t room for Van Alstyne to crack the big league roster. The opportunity to spend time with Williams during spring training allowed Van Alstyne to have a first hand view of what made him so special. He recalled a spring training game where Williams displayed his great attention to detail in what was an otherwise meaningless game. Van Alstyne played in the Red Sox organization through 1955 and then was purchased by the Yankees. He spent one year with their AAA team and retired after facing the task of supplanting another legend, Mickey Mantle. “I was behind Mantle in center field and we didn’t have free agency, so that was it,” he stated. After baseball, Van Alstyne went into financial planning for Connecticut Sigma and was inducted in to the St. Lawrence Hall of Fame in 2003 for baseball and basketball. Even thought he came up short with his attempts to get even a cup of coffee in the majors, Van Alstyne was without regrets.